Doctor Aphra #18 is part five of the “Remastered” story arc. Writer Kieron Gillen shares credit duties with Simon Spurrier and they have taken Doctor Aphra into, possibly, the most ambitious of sci-fi elements in all of Star Wars. Aphra is offering Hera Syndulla to the Empire but it’s simply a ruse to get aboard the Imperial R&D base called Hivebase-1. This is where Gillen and Spurrier ramp up the sci-fi quotient with an imagining of simply some of the strangest and most outrageous creatures, ships and weapons ever seen in Star Wars. 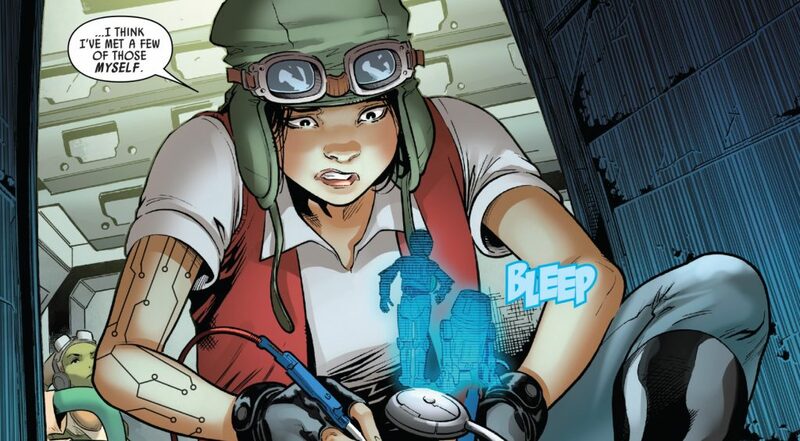 Aphra’s “kid in a candy store” like attitude and glee at the sheer amount of scientific exploration in her presence is a stand-out moment in the story. The semi-big tie-in or crossover in this issue, outside of Syndulla, is the mention of Doctor Cornelius Evazan. Since he first appeared in the Cantina scene in A New Hope and crossed paths with Luke and Obi-Wan he has gone from twelve to thirteen systems in which he has the death sentence. 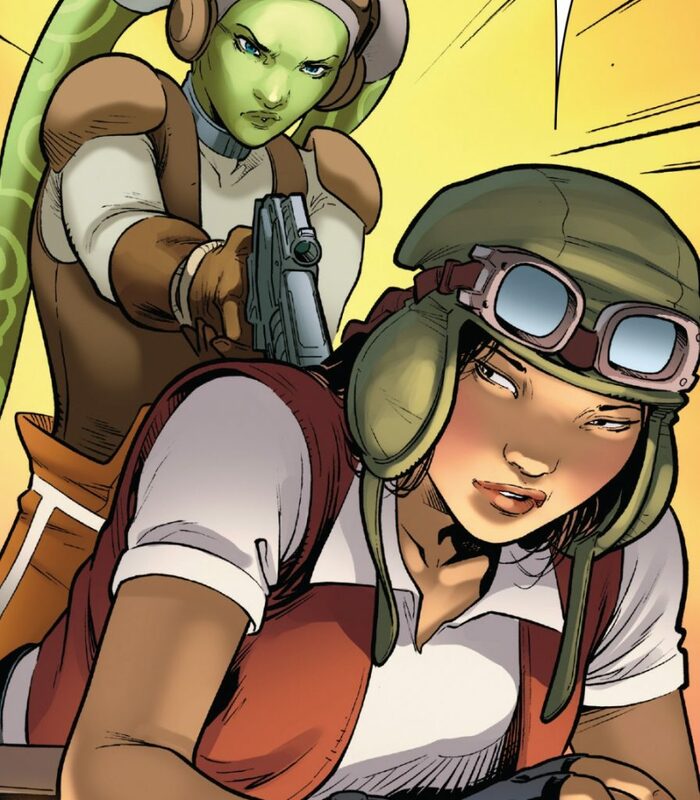 It’s a deep dive into the Star Wars universe but a nice touch seamlessly added indirectly to Aphra and more directly with her crew members Tam and Caysin. Their relationship is front and center at the beginning of the issue and ultimately caps off the climax of the action that takes place. It ends up a sweet and touching end to an odd pairing’s story. 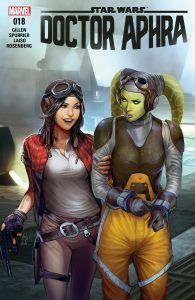 The whole issue is encased by the subplots of the Rebellion racing to rescue Syndulla and Lieutenant Tolvan’s struggle with her allegiance to the Empire and her feelings for Aphra which continually pull her in opposite directions. This all culminates with the “true” mission of accessing Hivebase-1’s archive data core for Triple-Zero. This part of the story is only lightly touched upon and even the appearance of Triple-Zero is short-lived. The lingering mystery here is the Hivebase’s commander, Yewl. He is hidden in the shadows throughout the story and for a good reason once he is finally revealed on the last page. Doctor Aphra is a series loaded with misleading alliances and backstabbing. It’s no different here but there seems to be much more of it compacted into this chapter. There’s a lot of action but much of it is more psychological rather than physical although there’s plenty of that as well. Artist Emilio Laiso’s work here is great and there’s a high amount of detail in the work and handles action very in large scenes adeptly. If some of these scenes had been sets for a movie they would be massive but Laiso navigates the reader effortlessly through them all. I don’t think I’ve mentioned this in any previous reviews but the covers of Doctor Aphra by Ashley Witter are stunning, this issue especially. Truly fantastic work. The Doctor Aphra series is most certainly off the beaten path of the Star Wars universe but a genuinely good story is being told here without much support from previously established characters. The environments and the sheer amount of no holds barred sci-fi elements make the book worth checking out. Chapter five of “Remastered” felt nothing like a conclusion and only sets up for what should be an action-packed next issue. Doctor Aphra #18 is a solid and fun read. It is one of the densest in terms of plot and one of the most entertaining in sci-fi indulgence. Highly recommended for those looking for something a little more outside the Star Wars box!